We’d love your help. Let us know what’s wrong with this preview of Chasing Shadows by Ashley Townsend. The murder of an ancient king spurs Sarah Matthews to travel back in time, putting her life in jeopardy as she races against the clock to solve a thousand-year-old mystery and pick up the pieces of her star-crossed romance. Her return to Serimone reveals that the kingdom is Would you choose to entwine your fate with a hero of the past, even if it meant altering the future? To ask other readers questions about Chasing Shadows, please sign up. Sarah Matthews is trying to forget her time-travel experience. College is about to start, and she’s in a frenzy to prepare for moving out – her room a mess. But in a whole different realm, a royal has died, foul play is suspected, and a young man longs for Sarah to return. She wistfully keeps a special necklace … but would have never expected the person who arrives on her doorstep one day. In Serimone, new adventures and escapades abound. New romantic interests, danger, suspense, sweetness, and working through tangled relationships. What Sarah thought was in the past is definitely not over yet. Alright, so the beginning of Chasing Shadows could feel a little long. But not exactly dragging; because by the end of this book, I just feel it’s a beautiful, epic, exciting story that you can’t wait to dive back into! Something about long books where you’re simply getting to know the characters a bit before you really get into the action … they’re great! I really enjoyed going back to Chasing Shadows pages again and again; and am so happy that it graces my bookshelf! I also felt that came about more smoothly, clearer, and satisfactory than the first book; so good job, Ashley Townsend! Excited to see where Defying Shadows brings us! Sarah … I got way more frustrated with her in this book! That horrid love triangle! I just do not understand girls who lead on two guys for like, forever. (Think Katniss and Gale and Peeta. Grrr.) So there were a few times when I wanted to give Sarah a good talking to. Ha. Like, stop fooling around and acting so oblivious and silly, and fight for the man who you truly love! But I will say, by the end of the book, I understood a lot more why Sarah acted the way she did. It wasn’t really so much a love triangle after all … Well, you’ll see. In any case, I do see why Sarah did what she did. It’s understandable. So there was a little bit of a warning theme of guarding one’s heart, which I appreciated. I loved getting to know Will even better, and delving into his character more! *Sigh* There were a few instances when he really needed to step up and take the lead, I think; but overall, he was sweet, heroic, strong, and just … swoon-y. *wink* Haha. But truly, he’s a really valiant young man, who has a tragic past, and is broken on the inside, but too stubborn to let himself be healed. Really rooting for this guy, and hoping for really beautiful things to come in the next book! Of course, we have Seth and Karen, each who I liked even better in this book! A new dashing young man is introduced, Damien. The charming, wealthy, fun-loving guy who causes all kinds of complications in this story! *grins* Are you intrigued yet? You should be! There were a few other new characters too, who were all fun to meet! Not sure yet what to think of Jade, and the rather shocking revelation of her. Eek! What can this all mean?? As for romance, besides the love triangle deal, I really enjoyed it! ^_^ There were sweet moments, funny moments, heart-rending moments, exciting moments! I liked how Ashley Townsend explored their feelings in the awkward and the good moments. There was uncomfortableness. Caution. Tenderness. I enjoyed a certain young man’s chivalry and how he was gentlemanly with Sarah and concerned about her reputation and whatnot. That all being said, I would recommend at least sixteen and up as for audience for Chasing Shadows. Some compromising situations are indicated, scandal mentioned time and again, awkward moments muddled through. Yeah. The main character is eighteen, so it’s probably actually more suitable for that age and up. But then again, this series probably has a more YA feel. So, whatever. I didn’t feel that there was anything inappropriate or even overly sensual. Overall, very sweet. Though quite real at times. There was a little more of a violent/gruesome element than the first book. We have murderers on the loose, and quite a few intense and a bit gory scenes. Nothing radical. But it’s definitely a higher level than Rising Shadows. I sort of felt that Chasing Shadows dipped in and out of having a faith theme. There were some really deep parts, like Sarah explaining her devotion to God to a questioning servant. That was raw and real. And there were other parts, like talking to Will about God still waiting for him to return; prayer; and trusting God. But it was kind of sporadic. It didn’t really bother me too much. There were two instances of swearing, which I was slightly surprised to find. And then there were three or four times where it seemed God’s name was being used carelessly. I was confused about why Sarah would be misusing the name of the God she was so dedicated to. Maybe I read it wrong? Overall, I very much appreciated the Christian aspect of Chasing Shadows. Though it was perhaps a little more irregular than Rising Shadows; it still had some poignant and beautiful faith moments and thoughts. I think the end-ish was pretty strong and steady too, on that matter. I enjoyed Ashley’s Townsend’s first book in this series, and this book was just as filled with adventure, romance, deception… and it also involves time travel. And medieval-lness. There were twists and turns at every corner with new characters introduced that was quite entertaining to read. It starts off a few weeks after the first book, with Sarah trying to get her life back to normal after her adventures. But when an unexpected visitor arrives, Sarah suddenly finds herself back in the 12th cent I enjoyed Ashley’s Townsend’s first book in this series, and this book was just as filled with adventure, romance, deception… and it also involves time travel. And medieval-lness. There were twists and turns at every corner with new characters introduced that was quite entertaining to read. It starts off a few weeks after the first book, with Sarah trying to get her life back to normal after her adventures. But when an unexpected visitor arrives, Sarah suddenly finds herself back in the 12th century to help defeat an evil tyrant and save people she never realised she cared about. NOTE: I received a free ebook copy from the author in exchange for an honest review. Chasing Shadows is the second book of Ashley Townsend’s series and what a sequel it is! Our heroine Sarah Matthews travels from her modern day life to medieval Serimone once more, but this time the stakes are much higher now that the king is dead. The sinister Cadius may push himself to the throne, which would mean the end of happy days for Serimone. This story gets so much deeper into the setting and characters th NOTE: I received a free ebook copy from the author in exchange for an honest review. This story gets so much deeper into the setting and characters than the first one. In Rising Shadows we got to meet the characters and catch a glimpse of Serimone, in this one we dive headfirst right into it. I only thought I loved the characters, but I had no idea how deeply until I delved into the sequel. All the characters, from big to small, stole a little piece of my heart. I can’t express enough how wonderfully done their stories were told. Each one explored deeper, this book discovering tidbits of their pasts and how each reacts to hardships, heartbreak, tragedy, love. Dark sides within them were revealed, as well as good. I just love these characters, okay! The plot was also so engaging, though as with the first book I felt as if there could have been a bit more there. Cadius, our villain, only came into the story about halfway through and had just two or three brief appearances. I would have liked to see more of him and explore his menacing plots. It was sort of more character driven, focusing on Sarah’s, Will’s, and Damien’s relationships, than plot-focused. But, like I said, the characters are amazing and I adored watching their developments. So nothing wrong with that! But, let me assure you, there was still plenty of action and sinister plots to be had. Sarah found herself in danger many a time. The second half of the book especially had much action to keep one on the edge of their seat. I was devouring pages, dying to know what would happen next and how everything would lay out in the end. It kept my mind churning even when I wasn’t reading, and stuck with me throughout the day. The setting was also enchanting. Serimone is now in the midst of winter and the imagery of snow-topped buildings, woods shimmering in white, and warm fires inside the castle had me wanting to pack my bags, find a time machine, and go there myself. What really struck me about this novel was Townsend’s ability to make me feel. Whatever Sarah felt I did as well. My heart literally got to pounding a few times, and tears filled my eyes on multiple occasions. I could see and feel everything so perfectly, the whole story just came alive. This author knows how to tug at her readers’ emotions, let me tell you. Ashley Townsend clearly put her heart and soul into this novel. Chasing Shadows is a tale of love and heartache. It’s engulfed in a beautiful message of how even the most broken can be repaired, that God never forsakes His people and can pull them back up no matter how far they’ve fallen, and as Christians it’s our duty to show them His love. It has a cast to both laugh and cry with, a beautiful setting, and engaging plot, with a writing style that pulls you right in and keeps you there. The second print and reformatting (eep!) of Chasing Shadows will be coming out in late May, 2017. Be sure to keep your eyes peeled at your local Barnes and Noble, or support them online by buying. 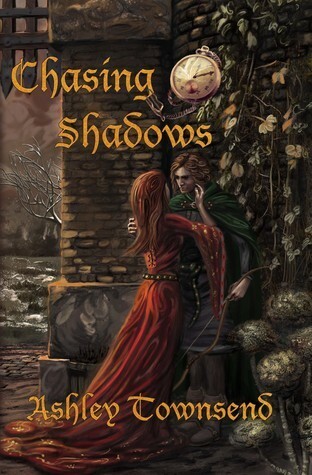 CHASING SHADOWS kept me guessing, there were lots of surprises, and it was overall a good and exciting adventure/romance! It was kind of too long for me, but that's just my personal preference. I felt a bit like the first half dragged somewhat, with the plot seeming to get lost behind a lot of emotions and the love triangle, and a lot of stuff seemed to sort of come out of nowhere. But the final third picked up considerably and turned awesome and very exciting and I absolutely loved it! I loved t CHASING SHADOWS kept me guessing, there were lots of surprises, and it was overall a good and exciting adventure/romance! It was kind of too long for me, but that's just my personal preference. I felt a bit like the first half dragged somewhat, with the plot seeming to get lost behind a lot of emotions and the love triangle, and a lot of stuff seemed to sort of come out of nowhere. But the final third picked up considerably and turned awesome and very exciting and I absolutely loved it! I had a hard time connecting with Sarah, the main character, since most of the time she drove me batty by being stupid. But I think that's likely just me, and I have a feeling most readers would like her better. And I still wanted her to win, of course! She did grow on me, eventually. Can we just take a moment to talk about Will now? Will was awesome and fabulous and I loved him a ton and he is one of my favorite characters now. He's basically a big broken strong huggable bundle of epic, the perfect mix of a dark-guy and a hero and an all-around great guy who is just awesome and can be really sweet at times too, though you wouldn't know it with his shell. His struggles and confused moments only made him more endearing. His caring and bravery and amazingness... just yes. He's a mean shot with a bow, too. ;) Will is basically the main reason I really liked this book. It's well worth reading just for him! The Spaniard was brilliantly done and I won't give anything away but it was fascinating how he was written. I have very complicated thoughts/emotions about the whole thing that I'm still working on sorting out. The medieval setting was really neat. It was that sort of "gritty", "realistic" sort of medieval that is more realistic than my taste would prefer, but I most people seem to like their medieval settings to be that way, so... *shrug* The whole book felt very REAL though. In fact, at times, it felt so real that it felt a bit more like real life than like a novel--like this was really happening to the main character. Very real emotions and problems and little day-to-day details instead of everything being streamlined and so dramatic and novel-like, if you know what I mean. Which was very different, somehow, and made me think about it, so even if I wasn't used to that sort of feeling, it was actually kind of cool. The level of detail was awesome! I just loved how detailed everything was. I could see and feel everything and felt perfectly immersed. I loved the lovely settings, like the castle with its ornate feeling at times, and the cold but beautiful snowy forest... just yes! I loved being immersed, and it was amazing to feel so much a part of the world. I definitely felt like I was there. I wish the slight hints of Robin Hood stuff had been more explored (maybe more is in Book 1 and 3? I can hope! :)) but most of what there was, was cool! Even small hints are a lot of fun! -I really disliked the whole Jade plot though. I can't really say much about it because of spoilers but... just no. -I definitely feel like this is for older readers, higher teens and up maybe, just for some general content. -There were occasional touches of Christianity, for those wondering if it was there. -I haven't read much time travel, but this one was fairly neat! Interesting to read, anyway. This is a sequel, and I haven't read the first book yet, so maybe some things are more explained in that. Mostly though there were enough hints about the events of the first that I didn't feel lost, so you don't have to read it in order to "get" this one. I'm certainly now curious about it though and want to read the prequel--and the third one (when it comes out) to find out what happens! But at the same time, though I do want more, CHASING SHADOWS still wrapped up fairly well. It left me feeling happy at the end. Overall, it wasn't a five-star favorite for me, but it earned its four stars and I absolutely loved the last third of the book! Mostly, the problems I had with it were my personal preference, and I feel like many others would enjoy it more. If you like time-travel, medieval tales, realistic-feeling settings with a bit of grittiness, a love triangle and sweet romance, with a touch of Robin Hood and intrigue and adventure in castle rooms and snowy forests, this is the book for you. Not only did Ashley Townsend create another wonderfully epic novel, but she expanded the story a great deal and I literally have no clue what will happen next. There were twists and turns arou Review to come! Not only did Ashley Townsend create another wonderfully epic novel, but she expanded the story a great deal and I literally have no clue what will happen next. There were twists and turns around every corner, and I was left on the edge of my seat! There are new adventures, new love interests, and new dangers in places you would least expect them. Overall, this was a lovely follow-up to an already fantastic series. Chasing Shadows starts off several weeks after Sarah left Serimone. She's getting ready to leave for college in a couple days, and trying her best (but failing) to put her time in Serimone behind her. Sarah suddenly receives an unexpected visitor, and it's off to Serimone again...something Sarah didn't think would be possible. She comes to find out that 4 months have passed since she left, and the king is now dead. Karen needs her help in infiltrating the castle to prove that the king didn't die by natural means. While the beginning of this novel is a little slow, the story never drags. I really enjoyed being able to get to know the characters a bit more before really getting into the story. We get a little more background, and we get to experience castle-life before things get action-heavy. While the story was definitely clear in the first novel, Ashley definitely improved in not only her writing but also her storytelling. It resulted in a even more enjoyable experience while reading! Sarah did leave me feeling a bit frustrated at times in this novel, but by the end, I understood her actions throughout the story much more. I will admit that I wasn't the hugest fan of the love triangle because I didn't like how Sarah basically strung the 2 guys along. However, as I said, I did understand her actions more at the end of the novel. That being said, Sarah did grow immensely in this novel. She learned some important lessons and her character was forced to endure some very challenging situations that no one should have to go through. But Sarah comes out stronger and tougher than before. She learns things about herself and that is where the beauty of her characterization lies. Karen and Seth are the absolute cutest in this novel! Even though they aren't in this novel as much, it was still lovely to see how they are still there for Sarah when she needs them the most. We are also introduced to the charming Spaniard, Damien. As much as I didn't want to like him, I'll admit I ended up loving his dashing and charming ways. He adds some complications to Sarah's life, but he is so fun-loving and very sweet. Damien is definitely an intriguing character, and you'll have to read to find out more about him. We also learn more about Will in this novel, which is a major win! Ashley really delved in deep with his character, and the reader gets to explore just what makes Will tick. The reader sees how vulnerable he truly is, and that by blocking others out, he's only preventing himself from fully healing from his tragic past. Ultimately, I felt that I had a much better understand of his character after I was finished reading the story. While there were times (just like Sarah) that I wanted to knock some sense into him, he is still the sweetie that we have come to love. Will maintains his protective, heroic, and strong personality, and you'll fall in love with him even more after this book. The plot was fantastic, and while it was a bit more violent than the first book, it hits on some tough topics that force the characters to adapt and deal with challenges they never thought they would face. There were some pretty intense scenes that were written perfectly! The romance never overshadows the plot, and I loved the way Ashley went about writing it. She included all of the awkwardness and uncomfortable-ness of first love, but she also captured the tender, sweet moments that cause butterflies in your stomach. While innocent, the romance was still passionate and beautiful. I highly recommend checking this novel out if you are a fan of fantasy and romance. There's medieval times, gallant knights-in-shining-armor, masked balls, and deception at every turn. Ashley Townsend crafts a wonderfully unique tale that you won't be able to put down! I can't wait to see what happens in Defying Shadows. Chasing Shadows has this beautiful message: broken things are worth fighting for. As an incredibly broken person, I know this in my head, but I struggle believing this at my very core. To see this message presented and reiterated so clearly throughout the story at a time when I desperately needed it absolutely wrecked me. I truly can’t commend Ashley enough for Will’s character. While very much a hero, Will realizes both his own brokenness and the broken situations around him. He struggles to fig Chasing Shadows has this beautiful message: broken things are worth fighting for. As an incredibly broken person, I know this in my head, but I struggle believing this at my very core. To see this message presented and reiterated so clearly throughout the story at a time when I desperately needed it absolutely wrecked me. I truly can’t commend Ashley enough for Will’s character. While very much a hero, Will realizes both his own brokenness and the broken situations around him. He struggles to fight through those situations, and even learns a little bit how to let someone else fight for him. Unlike Will, Sarah is a natural at fighting for broken things. She’s empathic, quick to understand where another person is coming from. Even when she’s been betrayed, she strives to put herself in their shoes. Beautiful. What I loved best about Sarah in Chasing Shadows, though, were the dilemmas she faced. I won’t delve into them (you’ll have to read the book yourself), but I wholeheartedly understood her muddled feelings as she weighed her options. I think this is one of my favorite plot elements in any kind of story: the heroine learns about herself through the choices she faces. I just … get it. Aside from Sarah and Will, there’s a great cast of characters who move around much like characters in a television show, in that many of them often make brief, sporadic appearances. Townsend also introduces a dashing new character, Damien Lisandro, who has quite the personal history and befriends Sarah when she comes to work at the castle. Chasing Shadows is full of adventure, mystery, and of course, romance. I lost count of the happy sighs it pulled out of me. So the next time you just need a feel-good read, head over to Amazon and get your copies of Rising Shadows and Chasing Shadows. Trust me. Can’t wait for book three! This book picks up a few months after the ending of Rising Shadows. Sarah is heading off to college, and has been doing her best to forget about her adventures in Serimone, before she lost her heart to Will there. But when Karen comes knocking on her door, begging Sarah to return, she has no choice but to comply--and to find herself caught up in a mystery regarding the king's death. Sarah was considerably more active in this book. She grows in courage, finding herself in bad situations yet always remaining calm enough to find a way out. We get to see what a kind person she is during her care of Damien. However, I still would have liked to see a bit more character growth from her. Though she did go through devastation, I feel like she could have been impacted significantly more. It would have been nice to see Sarah emerge from such devastation headstrong and determined to do what was right, with or without help, perhaps even acting a bit reckless. The romance aspect had both highs and lows. We were drifting a bit towards a love triangle, which concerned me greatly. I couldn't help but cringe a bit when Sarah started friend zoning Damien, as well as when Will caught Sarah and Damien together. A bit predictable in some aspects. But once Sarah and Will made up, the romance did a complete 180--it became exciting, sweet, and very enjoyable to read. Exactly what I wanted from the start! One thing I was grateful for was the lack of faith-drive plot. In the previous book, the abundance of Christianity made me feel a bit alienated, as I do not identify as being Christian. However, I do think that faith is a large part of Sarah's character, and it shouldn't be taken out completely. The author did a great job balancing it in this book, keeping it to a minimum but still letting it have a way to motivate Sarah at times. I didn't feel like an outsider, and still was able to see the importance of faith for Sarah. Though I enjoyed the plot and the various moving elements surrounding the king's death, I found the pacing to be a bit slow, not picking up until the final quarter of the book. I did enjoy the climax, as there was more action and more severe consequences that followed. It was generally more exciting than the first book, for sure! This is one of the best books I've ever read! I mean it! This one is definitely going on my favorites shelf. And the best thing about this book is that it is Christian Fiction! That's not just a tag, by the way. I love how Sarah would want to reach people for Christ, and that wasn't boring at all. First off, let me thank the AMAZING author Ashley for sending me an e-book copy of this for free! To be honest, I wasn't expecting at all for this series to be amazing...but a WOW. First off, let me thank the AMAZING author Ashley for sending me an e-book copy of this for free! To be honest, I wasn't expecting at all for this series to be amazing...but after the first book, I knew that I was sooo wrong. I cried about five times reading through this book...the only other book I've cried over was "Where the Redfern Grows." Damien was such a well built character...I couldn't help myself but feel the same way for him as Sarah did. Although he deserved what he got, I couldn't help but wish he could come to know Christ. I'm hoping that the third book would do that! Will was a well developed character as well! For some reason, I can feel Damien's feelings more than Will's, but that might only be because of pity for Damien. I loved the fight scene at the end, and how Will was ready to give up his life for Sarah. Sarah, in my opinion, was way more agreeable in this second book than in the first. I was very frustrated at her for leaving Serimone without saying good-byes , and also when she was less careful than she should have been n the first book. However Sarah has improved a LOT in the second book, and I'm looking forward to read the third book! Thank you again, to Ashley, for being such an amazing author! And I can't wait to read the third book! I just finished the 2nd installment in Rising Shadows, and I must say, I am glad I stuck with this series. So in this book we find out, Sarah is to travel back to Serimone in hopes of finding out who has killed the King. She learns that new maids/servants are needed in the castle. She quickly sees this as an opportunity that will hopefully aid in solving the King's murder. Little does she know the dangers she will face as result of her choice. Once in the castle, Sarah is busy at work after meeti I just finished the 2nd installment in Rising Shadows, and I must say, I am glad I stuck with this series. Once in the castle, Sarah is busy at work after meeting a new friend, Edith (a senior servant, so to speak) who shows her the ins and outs of her daily duties. One day, while cleaning, she happens to over hear men arguing in a room. There is a scuffle and a man, Lisandro, od injured, Sarah finds he is quite intriguing. I mean who wouldn't be drawn in by a man who is pretty much tall, dark and handsome with an accent? :) After nursing his wounds that day, she is sent into town to run some errands, by the time she returns, she learns her room has been moved, and she was requested to be freed from servitude and made a Lady. As things go a bit south with Will, she spend is also spending more time with Lisandro, and at this point she is questioning herself, because although she knows how she feels about Will, Lisandro is sending her feelings into a tailspin. As in the first book there are all kinds of things going on, mysterious deaths, a counterfeit Shawdow, heart-breaking "secrets", betrayal, another ball, blooming relationships and more. What kind of trouble will Sarah get into while living in the castle? What ever will happen in this new love triangle? Will Sarah find the killer? I was provided with the book from the author, Ashley, who's incredibly sweet, for an onest review. Oh my god.. This book kept me awake at night wondering what will happen next! I absolutely adored the characters, even the bad ones. Yes, even the bad ones because they were written so perfectly that I could not help but be emphatic about them. Although I kinda wish some characters like Cadius and Karen had been in the scenes more. The whole concept of time travel was just intriguing and made me want I was provided with the book from the author, Ashley, who's incredibly sweet, for an onest review. I absolutely adored the characters, even the bad ones. Yes, even the bad ones because they were written so perfectly that I could not help but be emphatic about them. Although I kinda wish some characters like Cadius and Karen had been in the scenes more. The whole concept of time travel was just intriguing and made me want to know more. The world of Serimone was just what I expected it to be like. I can only imagine how beautiful it would be clad with snow. The character development was as much as it was needed. Sarah, the protagonist, however could've been more inconspicuous and not this brazen when she knew it would lead to destruction in her life. But don't we all do things we regret later? I however, found that the language they used was normal, as in not like something people would talk like in the earlier era. But somehow it didn't bother me at all. I lost myself in the world, and I understand how difficult it must have been for Sarah to choose one world. I absolutely loved this book! This book is unique and different than anything I've read before. I love the concept and Ms Townsend does a fantastic job telling this story. There was good character development, I felt connected to so many of these characters. I laughed with them and cried for them. The balance between the action, romance, and mystery was perfect. Another thing I loved was how Ms Townsend references God. It's refreshing to see someone talk about God in a YA book. It's not in an overwhelming or pushy way, so if that's something that really bothers you, I don't think it would bother you in this context. I am so excited that there is going to be another book! I don't know how patient I can be waiting on it! No, it was far from over. Chasing shadows transports you to Serimone, a vibrant castle one thousand years ago in the past. This is an intriguing mystery, with many plot twists. The characters were well developed, including the supporting roles. The Jones’ and Mathews’ family dynamics added a wholesome quality to the story. Sarah learns a lot about herself and the people in Serimone, as she races to solve a murder mystery. Enjoyed the trip! Thank you for trusting me to write an honest review, Ashley! Here's my short review. In terms of plot, I found this book more exciting than the last one. As for characters, I also grew to like Will and found Damien to be a fascinating addition. However, I still found it hard to root for Sarah as a heroine. I felt like her character did not chan Thank you for trusting me to write an honest review, Ashley! Here's my short review. In terms of plot, I found this book more exciting than the last one. As for characters, I also grew to like Will and found Damien to be a fascinating addition. However, I still found it hard to root for Sarah as a heroine. I felt like her character did not change much. I also felt that the love triangle in this installment was too distracting and even the romantic scenes with the main couple got over-the-top at times. I really liked Ashley's character development and I felt at the end of the story I had a better understanding of who the characters were, even though I'm sure we're first introduced in rising shadows. In a way I felt her style had been influenced a little by Dickens. There are parts of the story but jumped out at me and Ashley did a fantastic job of using words to paint and extremely vivid picture. My favorite part was the fight scene between Will and Damien. It was written as if she wanted the I really liked Ashley's character development and I felt at the end of the story I had a better understanding of who the characters were, even though I'm sure we're first introduced in rising shadows. In a way I felt her style had been influenced a little by Dickens. There are parts of the story but jumped out at me and Ashley did a fantastic job of using words to paint and extremely vivid picture. My favorite part was the fight scene between Will and Damien. It was written as if she wanted the reader to see what she was writing, so detailed, I actually felt as if I could see the fight as it took place. There were points in the story that I could see what Will, Sarah, and Lisardo look like. One of those books that I was unable to put down I just wanted to turn my page to see what happens next. At some points it was unclear of what genre Ashley wanted to write in , whether it was sci-fi, fantasy, romance,in the end I felt that it was a combination of the 3. I like how Ashley was influenced by Disney's Robin Hood, one of my favorite Disney Movies and an underrated one at that. Well done an excellent read I would recommend this book to anyone. Absolute plant writing and I can't wait to see what the next books are by this incredibly talented author. I really can't stop raving about how great this book was I thoroughly enjoyed it. Her writing style has improved since Rising Shadows and can't wait for Defying Shadows, I want to know what happens next. Just one question stuck out where did she find the term seat meat?